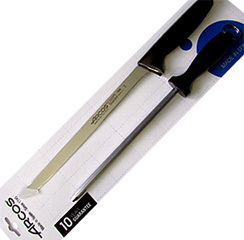 Ham Cheese Wine offers in this category the accessories needed to cut Spanish ham. 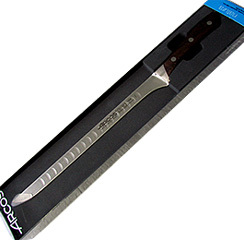 Ham cutting accessories are indispensable in order to make the correct cut in every part of the ham and at each stage. So important is the ham itself as the right tools for cutting and properly let you enjoy the flavors of each piece of ham. 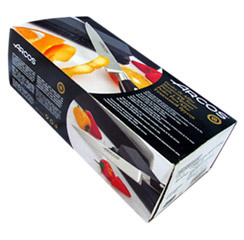 We have knives and ham holders at the best market prices such as Ham cutting knife NITRUM Arcos Universal Series, a perfect knife to get the best cut of ham and, wooden holder for Spanish hams Gondola model. 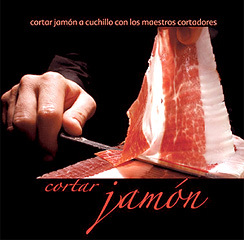 In addition, a book that will teach you step by step, cut by cut, to master the art of cutting Spanish ham. You can become a master slicer too! 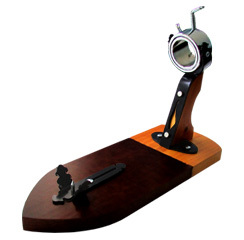 Wooden Ham Holder Bellota III model with acorn shaped base and lacquered in two colors. Ideal for both home and professional use. 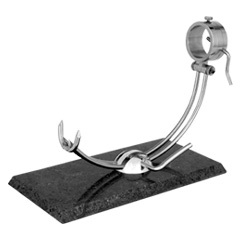 The chrome swivel bracket allows ham cut in various positions and ways. The fittings come thermo-lacquered paint finishes, except for the rotary cap is chromed, includes "v" slider can be set in various positions, depending on the size of the ham. Made of Premium high quiality Pine Wood Tea, with huge hardness and lacquered with non-toxic products. Ham is the great Spanish classic. It is a versatile product that provides many solutions. Placing the ham in the ham holder depends on the type of consumer you are going to give the piece. If you were to consume the entire piece at a time, ham hoof must face upwards, but if it is to consume several times the hoof should face down, thus begin by the narrowest part of the ham is which have less fat and thus the previously dried. Ham Cheese Wine presents Cinco Jotas 5J ham holder. 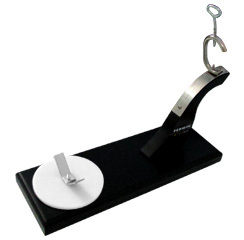 This is a very elegant and simple model at once, easily assembled and constructed of stainless steel and black Lucite with a unique presentation. 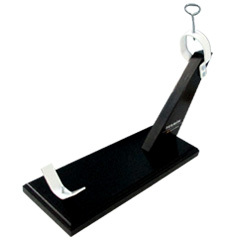 This ham stand has all necessary elements to securely hold a ham or a shoulder and make the cuts in safety and comfort features. 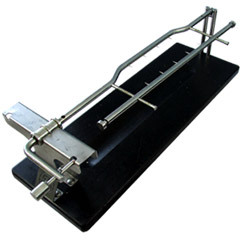 This is why we constantly recommend this ham holder because after having consulted several professional cutters, we have always had very good references. 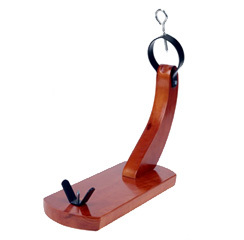 Wooden Ham Holder Dublin ideal for home use. Very hard and stable thanks to top quality Pine Tea Wood. 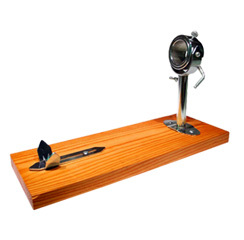 Wooden Ham holder Dublin model with the rectangular base and support formed by two wooden arms. 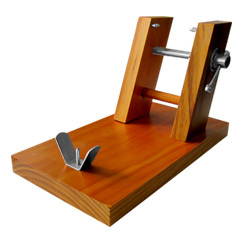 The wooden arms that support the ham are mobile, adjustable by a spindle when rotated hold the ham very stable and firm. Made of Pine wood Tea Premium high quality and hardness. Lacquered with nontoxic products. 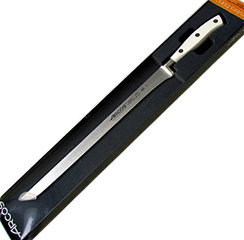 Classic wooden knives for more traditional. Martensitic stainless steel sheet high in Chromium, Lead chemical element in steel which gives the corrosion resistance. This steel achieves a minimum hardness of 52 HRC. Average composition: 0.30% carbon (C); 14% chromium (Cr); 0.30% manganese (Mn); 0.20% silicon (Si). The handles are compressed wood, resin sheets to improve resistance to water, hardness and durability of the parts in a dishwasher. Rivets stainless steel stamping. Once riveted, giving the complex a perfect and durable mounting. In pursuit of constant improvement and innovation, we relaunched our famous Riviera ARCOS series, with a quality that the difference of all, the white handle. 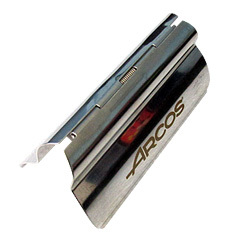 Forged in one piece, with ferrule French style with stainless steel NITRUM, exclusive of ARCOS, this series combines personal lines rounded, with the convenience and simplicity of its management, to the delight of all users, and whether professional or domestic, with the novelty of his white handle. The new Riviera Series was born to be different, to make you different. The warmth of mango wood, robustness and attractive STEEL DESIGN make NATURA NEW SERIES is a must for the discerning. The blade is stainless steel Forged NITRUM "which provides high hardness, high shear, mechanical strength and oxidation. The shape of the handle is where the charm of this series lies. Staff in their ways, and risky in their strokes. Mango Rosewood hardwood with excellent surface finish. Tongued stainless steel rivets, guaranteeing high corrosion resistance. In pursuit of constant improvement and innovation, we relaunched our famous Riviera ARCOS series, with a quality that unlike all his white handle. 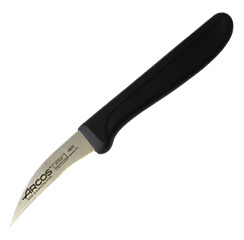 Forged in one piece, with ferrule French style with stainless steel NITRUM, exclusive of ARCOS, this series combines personal rounded lines with the convenience and simplicity of its management, to the delight of all users, whether professional or domestic with the novelty of his white handle. The elegance of gold next to black makes this knife a classic. Exclusive stainless steel high performance and durability NITRUM®. The handle is made of polyoxymethylene (POM) plastic material having an excellent surface finish and excellent properties of hardness, resistance to alkalis and aging, and non-deformable at high and low temperatures (-40 ° C to 150 ° C). Rivets and are tongued brass ferrule material high corrosion resistance and an attractive golden color that gives elegance to the design. Ergonomic design emphasizes its minimalist lines and robustness, along with the exclusivity of its double-edged. 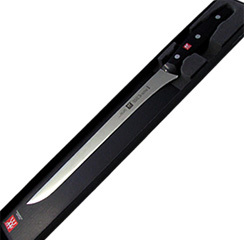 These knives are manufactured in one piece by forging the traditional process, starting from a unique high quality steel NITRUM®. Mango highlight its strength and innovative design, which combine contrasting color with black metal, thus giving a touch of distinction. It is made of forged stainless steel and polyoxymethylene (POM), with excellent surface finish and high resistance to detergents, aging and non-deformable at high and low temperatures. Innovation, distinction and elegance stand out in the New Tango Series. A dance for the senses. Minimalist modern design lines, where they combine color with black metal handle, thus giving a touch of distinction. Highlights include a visible full tang that runs inside the handle and holds its base, and its innovative assembly without rivets. 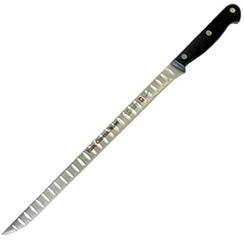 Stainless steel blade NITRUM high quality "and polypropylene handle. Innovation, distinction and elegance stand out in the New Saeta Series. A dance for the senses. Innovation, distinction and elegance stand out in the New Series Ham Cheese Wine. 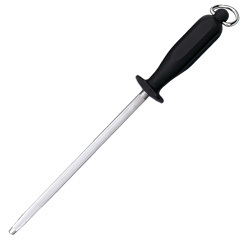 Highlights include a visible full tang that runs inside the handle and holds its base, and its innovative assembly. 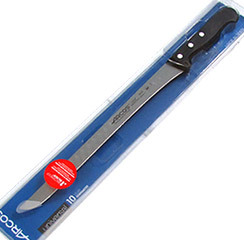 Stainless steel blade and handle high quality polypropylene. 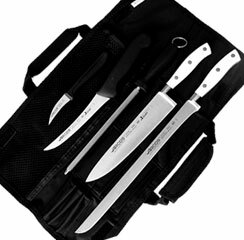 Keep knives sharp is a basic rule to ensure safety in handling them. 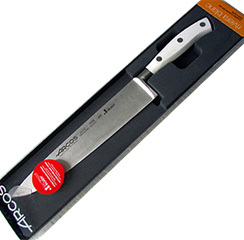 A sharp knife is safer, because the cuts will be made precise and effortless. Manufacturer of knives for more than 260 years ago, currently has a staff of about 500 people who manufacture 600 different models of knives and an average of 70,000 pieces a day. In an area of over 30,000 m2, divided into different plants in the province of Albacete (Spain), this industry rises. 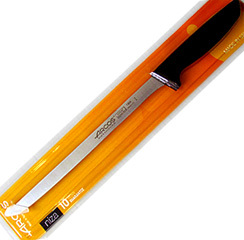 For those who like cooking, we know it is very important to have properly sharpened our knives. A sharp knife is going to greatly facilitate the task, and if we want to save trips to the hardware store or grinder, a professional sharpener at home is the best solution. A professional knife sharpener will not only assist us, but we will also help save keeping our knives in perfect condition. 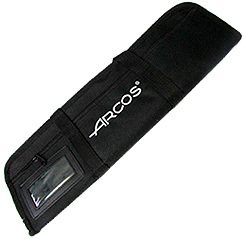 ARCOS, passion for accuracy. 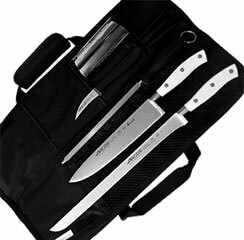 Manufacturer of knives for more than 260 years. 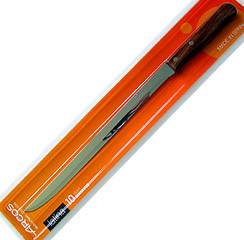 Small, light, handy and sharply pointed knife. 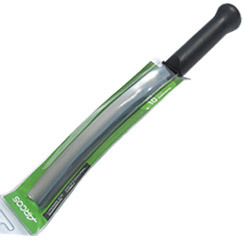 Lightweight polypropylene (PP) handle, hygienic plastic material with good stability to shock, can be used without problems until temperatures around 120-130 ºC. Professional Stainless steel Ham Carving Clips. Clips to pick ham slices after cutting, wherein the tip is curved. 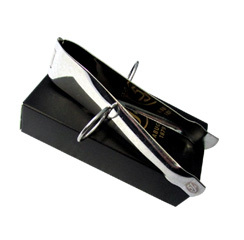 Five Jacks tongs have great flexibility and strength to allow high precision. They are made of stainless steel with what robustness, ease of cleaning and professionalism in the art of cutting ham is achieved. Professional gadgets are tools that have a practical purpose and a specific function, usually of small proportions, yet innovative. 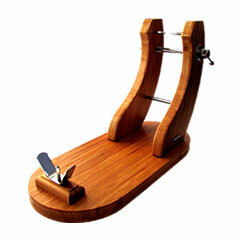 The design of these gadgets is ingenious, since its purpose is very specific. 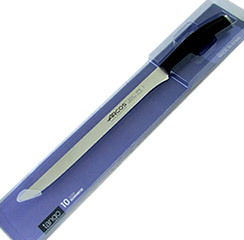 The blade is stainless steel very resistant and hygienic. Professional Stainless steel Ham Carving Clips. They are made of stainless steel with what robustness, ease of cleaning and professionalism in the art of cutting ham is achieved. 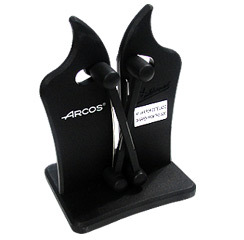 The ARCOS accesories have the function of making everyday tasks more comfortable. 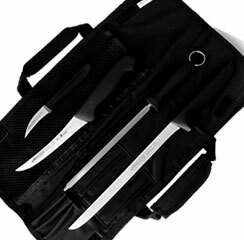 Professional ham carving Knife holster of fabric for 6 pieces for the transport of knives. 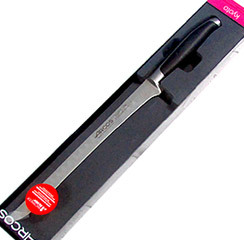 Ideal for professional chefs, ham master slicers and culinary students. 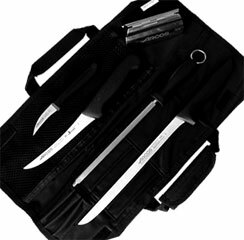 Once opened a double rug with nylon fabric on which to place and clamp the knife, clips and all your ham carving utensils. 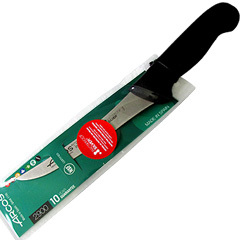 To ensure continuous performance knives needs to be sharpened regularly. In the cutting process the knife blades are worn. 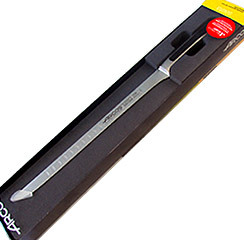 With the professional ham carving knife sharpener we can get them sharpened back again quickly and simply. ERGONOMIC HANDLE, comfortable and safe for activities naturally. They are made of polypropylene (PP) injected, hygienic plastic material with good stability to shock, non-slip and resistant to high temperatures (120-130 ° C). 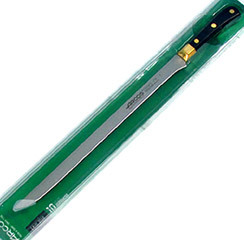 The joint between handle and blade is permanent thanks to the injection process with which they bind.